It's time to get our control under control. 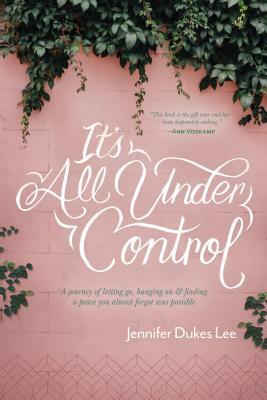 Jennifer Dukes Lee never thought she struggled with control. As long as everything went exactly the way she wanted it to, she was totally flexible. But then Jennifer discovered what happens when you try to wrap your arms around everything, thinking it's all on you: You get burned out on hustle. You toss and turn more at night, and you laugh less during the day. You're so busy--caring, serving, working, and trying so hard--that you can't even hear God's voice anymore. Discover a new way of living that will free you to be you, and finally experience the peace of knowing a God who truly has it all under control.